This is an opportunity to engage in a DIY, exciting and highly practical way with 16mm colour film. Participants will have the opportunity to shoot and work with colour reversal 16mm film, learn DIY processes and how camera and projector equipment can be adapted to other creative uses. 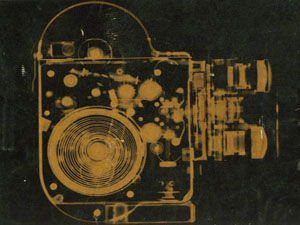 This will include shooting film on a Bolex 16mm camera, reversal film processing, hand contact printing and photogram techniques using black and white print stock - and many techniques to demystify the industrial processes of motion picture film! Participants are encouraged to come armed with questions relevant to the medium such as sourcing and adapting equipment, as well as the relevance of film to their practice. No prior knowledge of film is required to attend, although more experienced film makers/artists are also welcome. To book, please email us at workshops"@"cinestar.org.uk (please remove the "") or click the link at the top of the page.